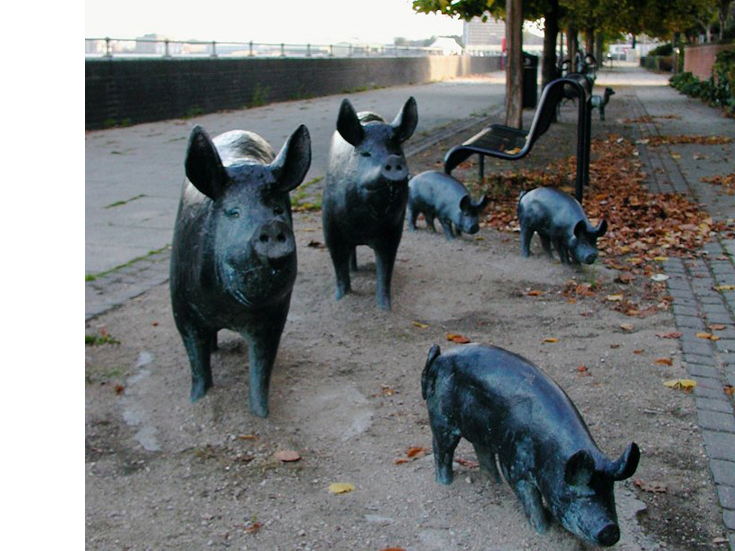 Fraser Borwick, Area Landscape Architect for London Docklands had the idea for a procession of life size farm animals making their way to Surrey Dock Farm. Philip made the pigs and piglets, Diane the geese and cat, and both Philip and Diane worked on the donkey. The sculptures were based on the sculptors own cat Freya, Bo the donkey and the geese from Walton Hall’s children’s Zoo (our sculpture studio was in Walton Hall from 1987 - 97). Phil studied the Berkshire pigs from Croxteth Farm Park, Liverpool. All our animals were made in direct plaster and cast by Castle Fine Art Foundry. The rest of the animals were by other sculptors - the goats in this photo were by Althea Wynne, and the fox by Majan Wouda can been seen chasing the geese on the alternat image by moving the cursor. The work has been moved to within the farm.